Researchers from the Universitat Politècnica de València (Polytechnic University of Valencia, UPV) have devised and configured a new 5G radio access system for intervehicular communication. The system is intended to improve road safety in a future scenario where 5G technologies are the norm. A continuation of the METIS project, METIS-II is an international project funded by the European Commission under Horizon2020 to research the efficient integration and use of various 5G technologies and components. Among its end goals is to optimise the performance and interconnection of in-vehicle mobile communications systems and, by doing so, contribute to improved road safety and lower traffic accident rates (though this is just one of many possible 5G applications). 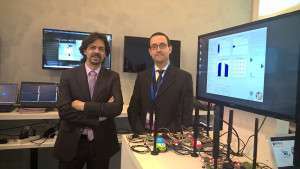 Some results of the project were presented at the Commission's stand at the Mobile World Congress held in Barcelona last month. José F. Montserrat, project researcher at the UPV's Institute of Telecommunications and Multimedia Applications (iTEAM), tells us: "The main novelty [of the new system] is that is allows the continual adjustment of waveforms in such a way that vehicles can communicate with each other, thereby overcoming the hurdle of not having a set station for communication". In terms of hardware, the system presented in Barcelona includes three programmable cards, each of which has a high-performance FPGA (field-programmable gate array) to integrate different waveforms, which are what carry data through the air, and four antennas. These cards will allow direct communication between vehicles, as well as the integration of intervehicular communications into conventional mobile communication systems. To show how it will work, the iTEAM researchers have developed a virtual environment that recreates the streets of Madrid. Their demo video can be seen via the link to the original article.